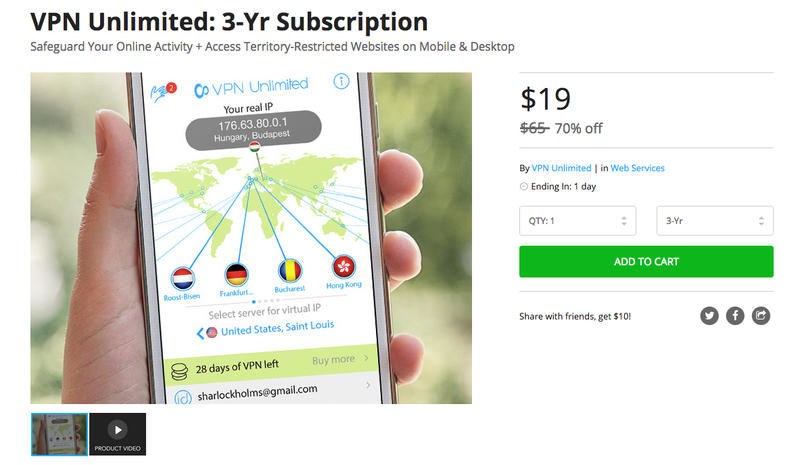 As a friendly reminder, this is your last chance to pick up a 3-year subscription to VPN Unlimited through the DL Deals Store, regularly priced at $65, for just $19. With a VPN, Internet users can browse and download files without fear over security concerns, with dedicated servers encrypting and hiding all of your sensitive data. With VPN Unlimited, users can secure any public WiFi connection they come across, which is perfect for those of who you might be more sensitive to security issues than others. In addition, VPN Unlimited offers online data encryption, unlimited traffic bandwidth, unlimited high-speed connections, as well as a growing selection of servers to choose from in many popular countries. If this deal interests you, follow the link below.